Targeting Tie-2 in patients with wet AMD or diabetic eye disease could allow clinicians to treat patients who have not responded to conventional therapies. The role that VEGF plays in neovascularization and vascular leakage in patients with age-related macular degeneration (AMD) and diabetic retinopathy (DR) has been carefully delineated. VEGF antagonists have become the most effective form of therapeutic intervention for patients with these diseases. However, VEGF is not the whole story, and anti-VEGF therapy may need to be supplemented with additional therapy. Researchers are beginning to understand the role that the angiopoietin–Tie-2 axis plays in the process of AMD and DR disease pathogenesis and progression. 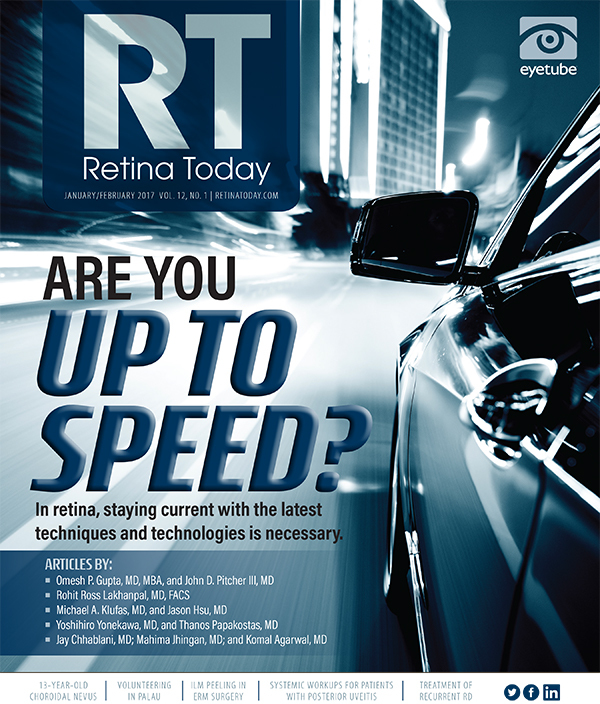 In this issue’s Innovations in Retina column, we review the mechanisms of action of angiopoietin-2 (Ang-2) and the cell surface receptor known as tyrosine kinase immunoglobulin and epidermal growth factor 2, or Tie-2, and their role as therapeutic targets in DR and AMD. Our discussion will review how these targets differ and the implications of their use for treatment of these disease groups. • Ang-2 and Tie-2 play roles in vascular proliferation in DME and wet AMD. • Upregulation of Ang-2 may lead to vascular inflammation and destabilization that could initiate or exacerbate existing ocular disease. • Combination therapies that simultaneously target VEGF and Ang-2 are being evaluated in clinical trials. Although researchers do not understand the Ang-2 signaling system as well as they understand the Ang-1 signaling system, it is known that Ang-2 expression is increased in several disease settings, including metastasis, sepsis, inflammation, wet AMD, and DR. Ang-2 appears to be critical to mounting leukocyte recruitment at sites of inflammation.4-5 Because the activity of Ang-1 and activation of Tie-2 lead to stabilized vessels and reduced inflammation, it is presumed that Ang-2 acts via inhibition of Tie-2 signaling, thus promoting vessel destabilization and inflammation. The complexities of the signaling pathways for angiogenesis provide clinicians with multiple targets for intervention, and technology allows the targeting of dual targets with a single drug or formulation. The Ang–Tie-2 axis is a critical tyrosine kinase cascade with multiple upstream and downstream ligands that can be manipulated. Directly knocking out Ang-2 frees up Tie-2 for Ang-1 binding, resulting in stabilization of vessels, tightening of junctions, and decreased endothelial permeability. Blocking Ang-2 would have the added benefit of inhibiting its Tie-2-independent direct angiogenic effects on integrins. Even in the presence of high levels of Ang-2, Tie-2 activation, by blocking the negative regulator VE-PTP as AKB-9778 does, activates downstream inflammatory and angiogenic signaling such as AKT, eNOS, and ERK, resulting in significant inhibition and regression of neovascularization. The next 2 years should prove pivotal in developing better means of treating ocular diseases of angiogenesis. The possibility of promoting vascular stability on a systemic level is particularly exciting in diabetic eye disease, which has far-reaching and devastating effects. 1. Jeansson M, Gawlik A, Anderson G et al. Angiopioetin-1 is essential in mouse vasculature during development and in response to injury. J Clin Invest. 2011;121(6):2278-2289. 2. Joussen AM, Poulaki V, Tsujikawa A, et al. Suppression of diabetic retinopathy with angiopoietin-1. Am J Pathol. 2002;160:1683-1693. 3. Kim I, Moon SO, Park SK, Chae SW, Koh GY. Angiopoietin-1 reduces VEGF-stimulated leukocyte adhesion to endothelial cells by reducing ICAM-1, VCAM-1, and E-selectin expression. Circ Res. 2001;89:477-479. 4. Fiedler U, Reiss Y, Scharpfenecker M, et al. Angiopoietin-2 sensitizes endothelial cells to TNF-a and has a crucial role in the induction of inflammation. Nat Med. 2006;12:235-239. 5. Thurston G, Daly C. The complex role of angiopoietin-2 in the Angiopoietin-Tie signaling pathway. Cold Spring Harb Perspect Med. 2012;2:a006650. 6. Gupta A, Bhatnagar S. Vasoregression: A shared vascular pathology underlying macrovascular and microvascular pathologies? OMICS. 2015;19(12):733-753. 7. Hammes H-P, Feng Y, Pfister F, Brownlee M. Diabetic retinopathy: targeting vasoregression. Diabetes. 2011;60:9-16. 8. Felcht M, Luck R, Schering A, et al. Angiopoietin-2 differentially regulates angiogenesis through Tie-2 and integrin signaling. J Clin Invest. 2012;122(6):1991-2005. 9. Shen J, Frye M, Lee BL, et al. Targeting VE-PTP activates Tie-2 and stabilizes the ocular vasculature. J Clin Invest. 2014;124(10):4564-4576. 10. Campochiaro PA, Sophie R, Tolentino M, et al. Treatment of diabetic macular edema with an inhibitor of vascular endothelial-protein tyrosine phosphatase that activates Tie-2. Ophthalmology. 2015;122:545-554. 11. Kloepper J, Riedemann L, Amoozgar Z, et al. Ang-2/VEGF bispecific antibody reprograms macrophases and resident microglia to anti-tumor phenotype and prolongs glioblastoma survival. Proc Natl Acad Sci U S A. 2016;113(16):4476-4481. 12. Kienast Y, Klein C, Scheuer W, et al. Ang-2-VEGF-A CrossMab, a novel bispecific human IgG1 antibody blocking VEGF-A and Ang-2 functions simultaneously, mediates potent antitumor, antiangiogenic, and antimetastatic efficacy. Clin Cancer Res. 2013;19(24):6730-6740. 13. A phase 2 study of RO6867461 in participants with center-involving diabetic macular edema (CI-DME) (BOULEVARD). https://clinicaltrials.gov/ct2/show/record/NCT02699450?term=RG7716&rank=2. 14. AVENUE: A proof-of-concept study of RG7716 in participants with choroidal neovascularization (CNV) secondary to age-related macular degeneration (AMD). https://clinicaltrials.gov/ct2/show/NCT02484690?term=RG7716&rank=1. 15. Anti-vascular endothelial growth factor plus anti-angiopoietin 2 in fixed combination therapy: evaluation for the treatment of diabetic macular edema (RUBY). https://clinicaltrials.gov/ct2/show/NCT02712008?term=Regeneron+DME&rank=4. 16. Anti-angiopoeitin 2 plus anti-vascular endothelial growth factor as a therapy for neovascular age related macular degeneration: evaluation of a fixed combination intravitreal injection (ONYX). https://clinicaltrials.gov/ct2/show/record/NCT02713204?term=Regeneron&rank=1. • chief medical officer at Ora, an ophthalmic clinical research and product development firm, in Andover, Mass. • regulatory writer at Ora, an ophthalmic clinical research and product development firm, in Andover, Mass.